Through the course of this year I was fortunate enough to gain a volunteer position with University of Melbourne's Museums and Collections Project Program. My project is through Grainger Museum, where I am researching and developing a tour program, including producing educational resources for tours to be offered by volunteers in the future. Processing the information contained within the museum is full on and done best by subdividing items and events into various themes and perspectives. The project, due to be completed at the end of 2017, will allow tours to be offered highlighting the key themes of Grainger’s world and the lives of those people who influenced him most. The item I’ve chosen to discuss today is Saint Olav Medal, 1954 (catalogue reference 01.0401), which was awarded to George Percy Grainger by King Haakon VII of Norway in 1954. This award epitomises Percy Grainger’s devotion to Edvard Grieg’s work long after his passing whilst highlighting the extent in which Grainger wanted his recognition of those he found influential noted. The award was giving not only for his support of Grieg but also for Norwegian music, but this medal also symbolises Grainger’s deep connection to Scandinavian music. 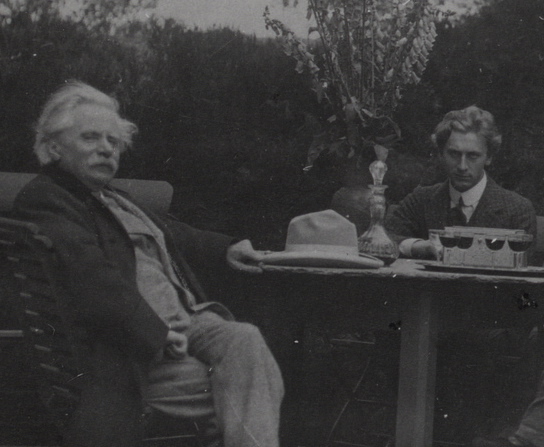 Edvard Grieg (1843-1907) was a Norwegian composer who crossed paths with Grainger in 1906. The collection holds much of their correspondence as well as letters from Grieg’s wife Nina in which they discussed Greig's funeral details. Edvard Grieg’s admiration for Grainger was symbolised by his wife’s gifting of his fob watch to Grainger in 1907, and this item is now in the museum’s collection. Despite Grainger’s consistent championing of Edvard and the admiration shown by Edvard and his family, Grainger still felt that he never achieved the greatness Edvard saw in him.